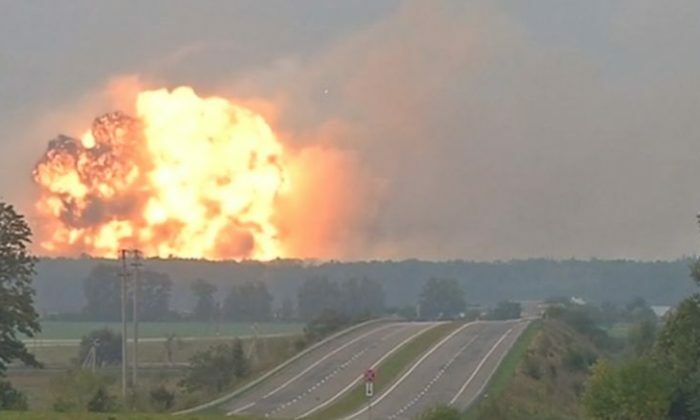 Massive explosions and a blaze at a military ammunition depot in central Ukraine forced authorities to evacuate 24,000 people and close airspace over the region, officials said on Wednesday. The blasts occurred late on Tuesday at a military base near Kalynivka in the Vynnytsya region, 270 kilometers (168 miles) west of Kiev, Ukrainian emergencies service said in a statement. One person was injured, it said. Arriving in the region hours later, Prime Minister Volodymyr Groysman said “external factors” were behind the incident.